Endurance sport does not only change the condition and fitness of muscles but also simultaneously improves the neuronal connections to the muscle fibers based on a muscle-induced feedback. This link has been discovered by a research group at the Biozentrum of the University of Basel. The group was also able to induce the same effect through raising the protein concentration of PGC1α in the muscle. Their findings, which are also interesting in regard to muscle and nerve disorders such as muscle wasting and ALS, have been published in the current issue of the journal Nature Communications. It's springtime – the start signal for all joggers. It is well known that a regular run through the forest makes your muscles fit. Responsible for this effect is the protein PGC1α, which plays a central role in the adaptation of muscles to training. The research team led by Prof. Christoph Handschin has discovered that such endurance training not only affects the condition of the muscles but also the upstream synaptic neuronal connections in a muscle-dependent manner. How do muscles change during muscle training or in muscle disease? Christoph Handschin and his team have been addressing this question for some years. In the past, they have already shown that the protein PGC1α plays a key role in the adaptation of the muscle by regulating the genes that cause the muscles to change accordingly to meet the more demanding requirements. When muscle is inactive or ill, only a low concentration of PGC1α is present. However, when the muscle is challenged, the PGC1α level increases. Through artificial elevation of the PGC1α concentration, it is possible to stimulate muscle endurance. 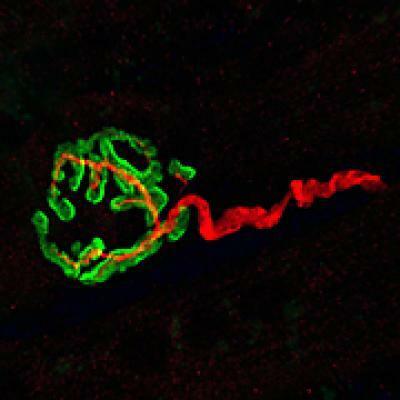 Neuromuscular junction: The motor neuron (red) is connected to the synaptic endplate on the muscle fiber (green). Now, the scientists have been able to demonstrate that the increase in muscle PGC1α concentration also improves the upstream synaptic nerve connections to the result of this feedback from muscle to the motor neuron: The health of the synapse improves and its activation pattern adapts to meet the requirements of the muscle. Until now, the influence of the muscle on the synaptic connection was primarily recognized in embryonic development. "That in adults, where the nerve and muscular systems are fully developed, not only the muscle changes due to an increase in PGC1α concentration but also a muscle-controlled improvement in the entire nerve and muscular system takes place, was completely unexpected and a great surprise to us", says Handschin. "Our current aim is to identify the exact signal that leads to this stabilization of the synaptic connections, in order to apply this for treating muscle disorders." A direct therapeutic application of the research findings in illnesses such as muscle wasting and amyotrophic lateral sclerosis (ALS) is already conceivable for Christoph Handschin. "In patients, whose muscles due to their illness are too weak to move on their own, an increase in PGC1α levels could strengthen muscles and nerves until the patients can move enough to finally do some physical therapy and to further improve their mobility", he explains. After the pharmacological improvement of the health status of the muscles and nerves, the patient could independently continue their treatment through practicing endurance sports.